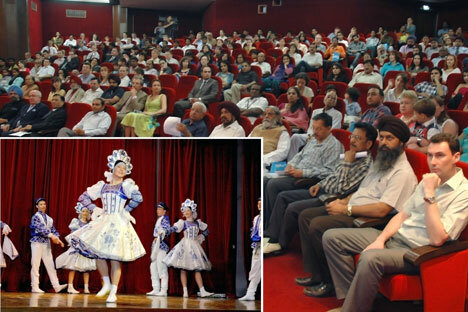 The Russian Science and Culture Centre in New Delhi on 12 April hosted the main events of the Russian Cosmonaut Festival in India, which was organised by the representative office of the Federal International Cooperation Agency (Rossotrudnichestvo), the Dostoyanie Interregional Public Organisation and the Russian Embassy. The events, which were dedicated to the fiftieth anniversary of Yuri Gagarin’s first manned spaceflight, included an open photo exhibition called Breakthrough to the Cosmos (as part of the Cosmic Odyssey project), speeches by prominent public figures, politicians and diplomats in addition to a concert performed by the Joy folk dance ensemble from Yekaterinburg. The main guest at these events was Russian Ambassador Extraordinary and Plenipotentiary in India Alexander Kadakin. In his welcome speech, he spoke about Russia’s current space programme, history and prospects for Russian-Indian cooperation in space research. Kadakin made particular mention of Russia’s participation in the Indian space programme Chandrayaan-2, the launch of the Indian-Russian student satellite UtSat as well as projects to build and launch the GLONASS global navigation system. Balbir Singh, the secretary of the ruling Indian National Congress party, said Gagarin’s flight had “colossal importance for the development of global science. In 1961, a triumphant scientific and technological event took place for the entire global civilisation, which marked the beginning of the active development of manned spaceflights and served as a major impetus for international cooperation in exploring space”. He stressed that Gagarin’s flight was met with jubilation in India and many parents named their children after the Soviet cosmonaut, who opened the path to the stars for people. These days, the Indians still have the same respect and interest in the achievements of Russian space exploration. Fyodor Rozovsky, counsellor and head of the Cultural Department at the Embassy of the Russian Federation in India, said there has been impressive attendance at the events held at the Planetarium and the Russian Science and Culture Centre to celebrate the anniversary. It’s telling that of the several thousand participants in the international academic competition Star Race, there are four schoolchildren from India travelling to the final in Paris. The real treat of the festival came when the Joy folk dance ensemble, Yekaterinburg’s oldest and most famous group, took the stage. The Urals artists demonstrated a rich array of Russian folk dances and awed the audience with their movements, fervour, acrobatic performances and bright costumes. The artists performed the beloved Madam, Russian Carousel, Caucasian Dance and Gypsy dances, which were created based on the Russian fairytales and traditions Swan Princess, Banya and Troika. Professor Ramadhikari Kumar, president of the Indian Association of Russian Language and Literature Teachers, said, “The ensemble lived up to its name and once again showed the breadth of the Russian soul and the incredible appeal of Russian culture”. The ensemble will also give performances as part of Russian Cosmonaut Festival events in the coming days at the Russian Science and Culture Centres in Mumbai and Trivandrum. Celebrations to mark the fiftieth anniversary of the planet’s first cosmonaut will continue in India until the end of June. The main events include a festival of scientific and popular films about space, lectures for schoolchildren and students and special programmes at planetariums. All the programmes will be accompanied by a photo exhibition, which will show the Indian public famous photos and rare images of Gagarin, footage of his visit to India and copies of the 1961 newspaper from the archives of the Embassy and Rossotrudnichestvo.